The promised rain came heavily during the night and continued on today. We had planned for this a couple of days ago and Mary spent the day visiting museums while I went into the Hauptbahnhof to get some seat reservations for our journey from Linz to Prague and to look around. 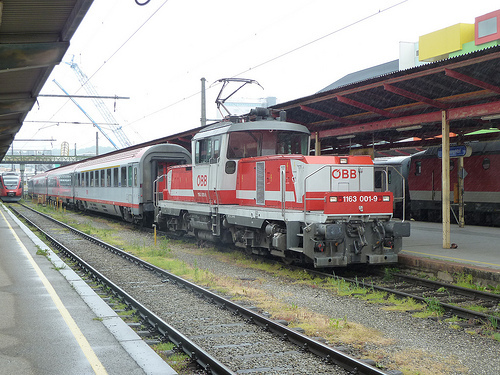 The OBB is pretty busy but manages to run most of its trains about ten minutes late. 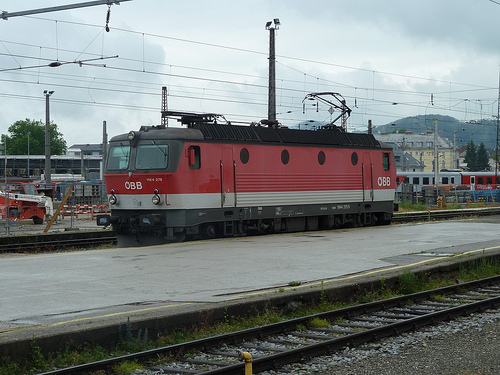 There was a great variety of locomotives, German and Austrian on the passenger trains as well as Austrian, Railion, DB Schenker and Cargo (SBB) on the freights. 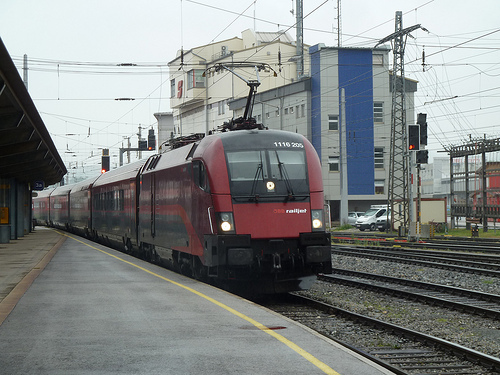 RailJet train from Vienna to Zurich using a standard OBB electric locomotive in a special paint scheme. I found a shop that stocked English publications and bought a Terry Pratchett book "Unseen Academicals". I shall enjoy it, I know. I have found a way to beat the motion detector in the bathroom area. All I have to do is to crawl around the corner on my hands and knees and slink around the shower. Dinner tonight was at K & K., right in the Mozartsteg. It was very good.